We have new pattern generators. 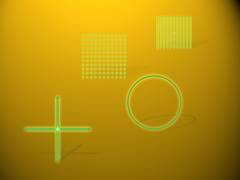 These complex diffractive optical elements (DOEs) are used to split a single laser dot or to shape it into patterns. Depending on the application, these patterns may include cross-hairs, lines, multiple lines, or a dot matrix. Cross-hairs with different fan angles, for example, are widely used in positioning tasks. DOEs are ideally optimized for a specific wavelength. Because the green 520 nm wavelength is becoming more and more popular, we have expanded our product range: In addition to a “green cross hair” with a fan angle of more than 50°, we also have a DOE with 15 parallel lines – also designed for the 520 nm wavelength. Several new versions have been added to the dot matrices: 10x10 and 4x6 matrices for green light, as well as 5x15 for red. We also have a pattern generator available for the first time for a blue cross hair. The fan angle in a 450 nm wavelength is more than 60°. We also satisfy the requirements of the growing field of 3-D imaging by offering new pseudo-random pattern generators for red and infrared laser modules.